The newest interior design trends for apartment living are officially in! We have the scoop on the styles that are sticking around during 2019 and others that you may want to kick to the curb. Looking at you, rose gold accents! Plus, everything we mention should be A-okay with any landlord. Just make sure you double check your lease before doing anything drastic. Rose gold is so 2018. Yes, the long popularity of rose gold accents may officially be over. There’s a new wave that’s embracing eco-conscious materials like bamboo, cork, wood, metals, and marble. Elle Decor is calling biophilia the new fancy and we are loving this trend because it focuses on the “relationship between humankind and nature.” Here are some ways you can benefit from incorporating natural elements into your home. Cork walls are all the rage since it also functions as an insulator against temperature and sound! Bamboo adds peace and tranquility to any apartment. Besides, we hear bamboo plants bring luck. There are endless ways to add natural wood into your home from wall art to coasters. Of course, furniture is the easiest way to add a little rustic, wooden flair. Using metal in your apartment is definitely meant as an accent. Display a vintage, metal bin to bring out a rustic feel or use metal, geometric decor items for a more modern look. Marble is a little trickier but works well as an accent. Use round marble containers to hold bigger cook wear, or use a marble tray in the center of your dining table. No, we aren’t talking about the decorative centerpiece sitting on your dining room table this time. We’re talking about that one iconic piece every homeowner or renter should own. It’s the one item that stands out. Your centerpiece could be a charming yellow chair, a unique piece of local art, or even a giant plant. Yes, Fresh Homes reports big, bold plants like a dragon tree or palm tree will become the most popular and captivating statement in 2019. 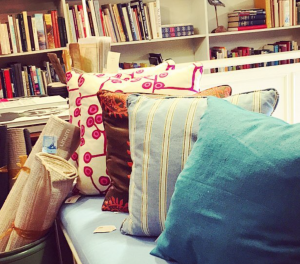 Did you know there are stores in Shadyside with amazing, unique items? Visit Penhollows, Weisshouse, Maser Galleries, Marcus Studios or Gallerie CHIZ to find your special centerpiece. Artist Ellen Chisdes Neuburg was the former owner of Gallerie Chiz and has now opened her own studio! The bold, beautiful colors reflected in this Shadyside artist’s work may be just the one-of-a-kind statement piece you need in your apartment to snap you out of the big-box “same-old, same-old” funk. Whatever centerpiece you have in mind, one thing’s for sure, get the item that starts all the best conversations. While we have giant plants and greenery on our mind, another way to bring nature inside is having multipurpose plants in your apartment. We aren’t talking about the bouquet of flowers you get yourself after a trip to the grocery store. We’re talking red plants, blue plants, tall plants, and all plants. That’s how the Dr. Seuss rhyme goes, right? Greenery and flowers do more than look pretty, which is why they are so appealing to apartment owners. Some plants like the Peace Lily or Snake Plants help cleanse the air. If you love to cook, growing your own fresh herbs could be your thing. Toadflax, the Shadyside Nursery, and Alex’s East End Floral Shop are a few local shops you can visit to get gorgeous plants in Shadyside. We hate to break it to you, but apartments tend to have less space than your everyday house down the street. One of the more wonderful things about Franklin West apartments is that many of our apartments are renovated Victorian homes! There’s a little more space than your average apartment building. Since renters deal with smaller spaces, getting crafty with furniture and storage is a must. To keep space from becoming a problem, multifunctional furniture is a renter’s best friend. Look for a storage ottoman or a sofa that pulls out as a bed. Though fair warning on that, sofas with built-in beds, can be very heavy. If a sofa bed isn’t something you’re interested in, think about adding a funky futon to your clean-lined, minimalist furniture mix. Also, investing in containers or dividers to help organize drawers and closets will absolutely keep you from getting overwhelmed. Check out our declutter checklist inspired by the Tidy Up queen herself, Marie Kondo. We talked about the many new trends you can add to your space like big, yellow couches to nature galore or even remove like saying goodbye to rose gold. The last concept we want to leave you with is about creating balance. Freshome says visual weight is the “measure of force an object has on the eye, otherwise known as a measure of how heavy an object looks.” In short, when decorating your space make sure you have a balanced mixture of heavy or large items and smaller, accent pieces. When you successfully balance visual weight, you will have created one amazing space. There you have it. 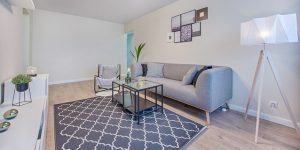 Apartment trends that are adding a new spark to renters in 2019. To sum up, any time you can incorporate natural elements into your apartment, do it! Just make sure you keep things balanced. Nothing beats the charm of small, locally-owned shops. After ten years, Penhollows continues to captivate anyone who happens to stroll by. The wonderfully unique shop has a nice mix of art, antiques, home goods, and books. Collecting ever-evolving items, much of the merchandise combines new and vintage themes to reflect a worldly style while celebrating the achievements of local artists and writers. Catering to a wide variety of styles and budgets, Penhollows opens its doors at 11 am on Tuesday through Saturday and closes at 5 pm. Guests are also welcome on Sundays from 12 pm to 4 pm. Don’t try to go on Monday, though, it’ll be closed. Always a plus, Penhollows is located in Shadyside just a few blocks from Franklin West apartments. If you’re looking to liven up your space with the perfect conversation piece, you’ll surely find something that speaks to you at Penhollows. Penhollows carries merchandise from several different vendors that mirror high quality, innovatively styled, has worldly influence, and thoughtful design. Much of their inventory changes with the seasons, as well. Penhollow steps right into the spirit of spring, with cute little Easter bunnies and floral printed decor. Whether it’s a family member or a good friend, gift season is a year-round thing. Instead of defaulting to giving a gift card, why not shake things up a bit. You’re bound to find something for everyone, from intriguing books and newborn onesies to upscale perfume and a three-piece shaving kits! Don’t have anything for that white elephant party coming up? Penhollows absolutely has your back. Wanting to help create your perfect environment, Penhollow’s Design Center offers full interior design services. The talented staff serves as a resource for customers looking for distinctive furniture that’s truly unique. They understand that your home reflects your lifestyle, so customers will be able to access leading furniture, fabric, floor covering, and lighting lines. But, don’t forget to call (412) 665- 0767 or send an email at us@penhollows.com to schedule an appointment first! Penhollows might not be the biggest in square footage, but it sure makes up for it in quality with a pleasing reputation. Check out their site or follow them on Instagram @penhollows. On the other hand, you just can’t beat visiting in person! Design trends are quite the enigma. What once seemed tired soon becomes the most popular aesthetic in recent years. Kicking off our apartment decor series, we’re here to discuss white walls. You’ve seen them in Kinfolk magazine, you’ve seen ’em on Instagram, and you’ve likely seen them in your chic friend’s living room. The question remains: how do they look so cool? What’s the formula for perfecting the minimalist, white wall trend? Well, friend, we’ve compiled some handy tips to answer this very question. Prepare to make your Shadyside apartment the hippest hangout around in just a few simple steps! White walls give your furniture, wall art, and decor accents the chance to take center stage. Bring the pizzazz with vibrant throw pillows, patterned pieces, and bright pops of color. Your living space shouldn’t feel like a perfectly curated showroom — make it unique by putting your special touch on things! That witty, pink needlepoint that was gifted to you by your aunt? Frame it. Those patterned throw blankets you picked up while on vacation in Mexico? Bring ’em out! Let your colorful personality shine, and your decor will, too. To avoid a white-walled room that feels cold and barren, breathe life into your home decor by introducing lush greenery into your space. Think fiddle-leaf figs, snake plants, lucky bamboo, and more potted succulents than you know what to do with. Green leaves contrast against white walls with refreshing ease, and you know what they say about house plants increasing happiness and fulfillment, right? It’s a win-win! 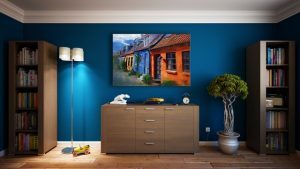 While furniture, color schemes, and decor items are certainly essential to a room’s overall components, no interior design is complete without texture. It may play a supporting role in a space’s function, but texture is no less vital to a design’s success. Texture appeals to our senses by adding dimension to a room, and works in both the visual and tactile sense. Add texture with an eye-catching rug, a statement art piece, a carved wooden table, or unique metal accents.